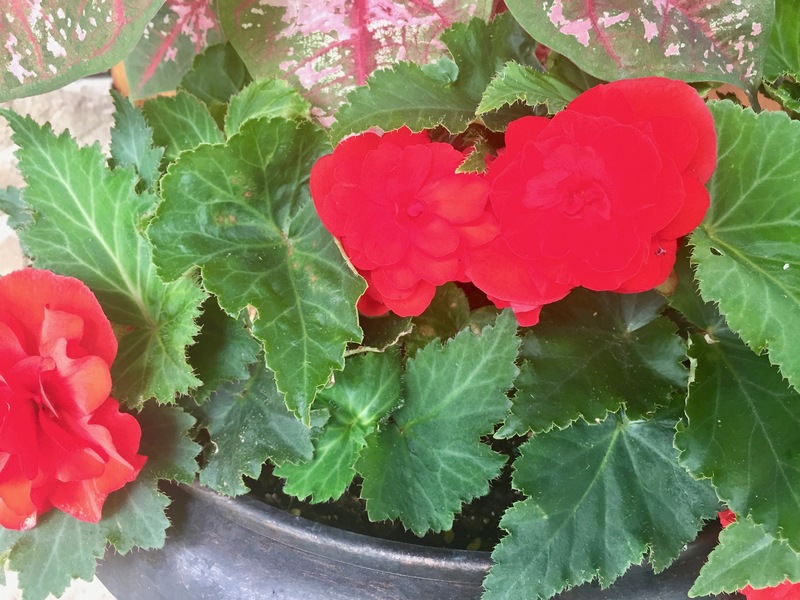 Tuberous Begonias are one of my favorite “potted plants”; I always include them for a dramatic pop of color in my pots on my porch. 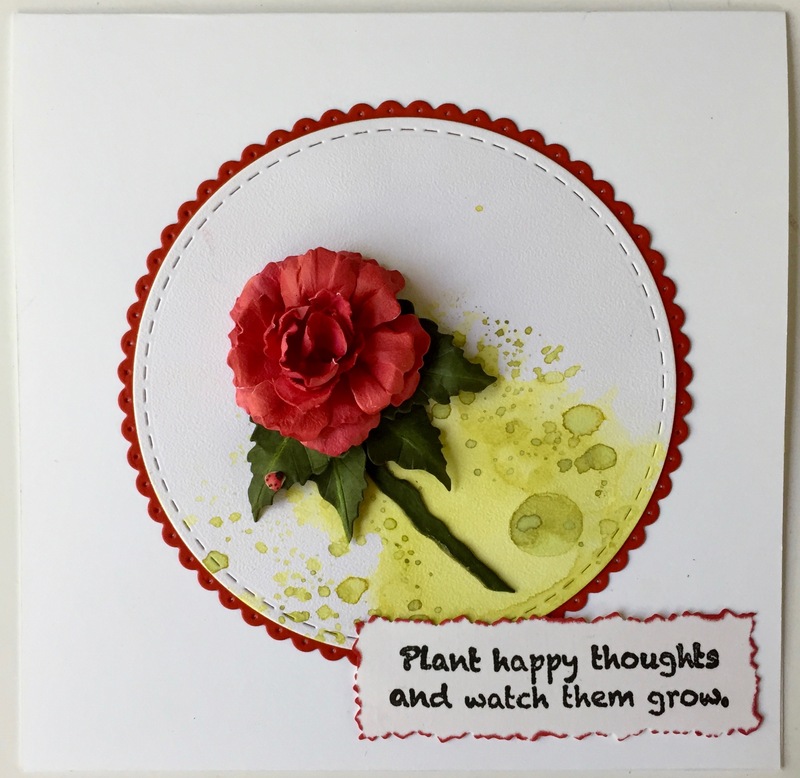 It’s also one of my new Garden Notes flowers that was released in June and is now available. I wanted to step out the direction so you can get started with adding these beauties to your garden. These red Begonias enhance the beauty of the Caladiums in my front porch urns. 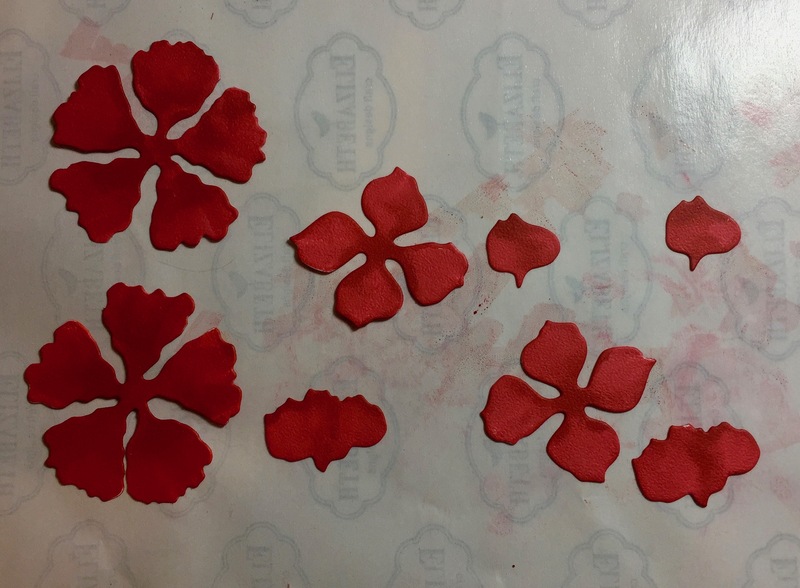 I die cut the four pieces of the flower twice using Soft Finish White 85 lb. cardstock. 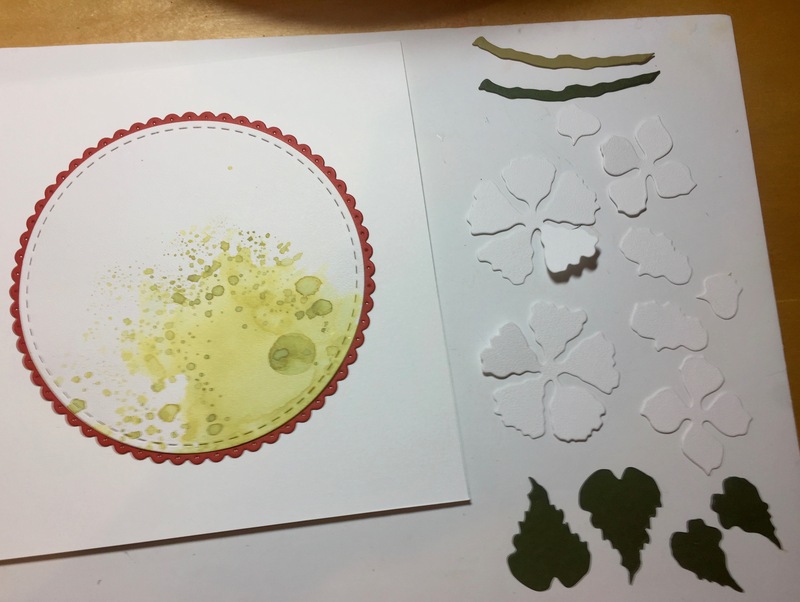 I also die cut two stems; one in medium green 80 lb cardstock and one in a lighter green 100 lb. cardstock. 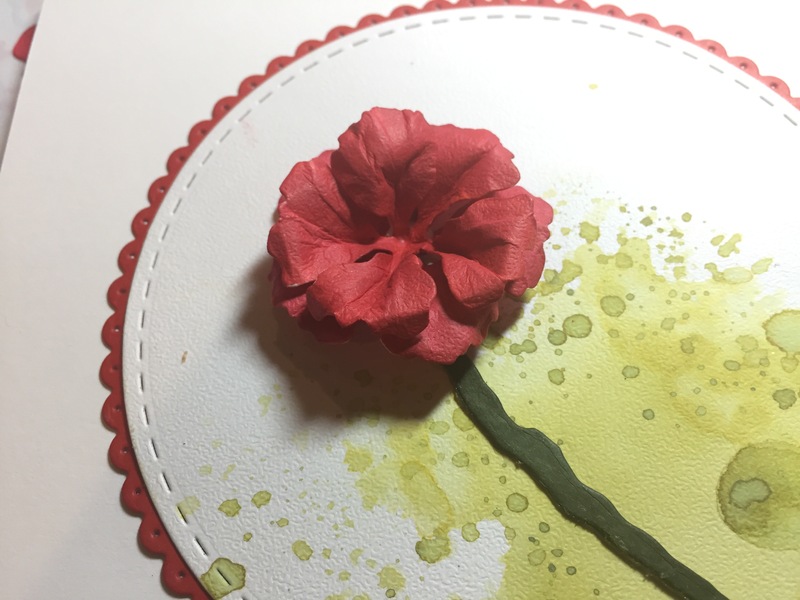 I colored all the petals with Copic R29, front and back, and I used some Beacon Zip Dry glue to adhere the two stems together. 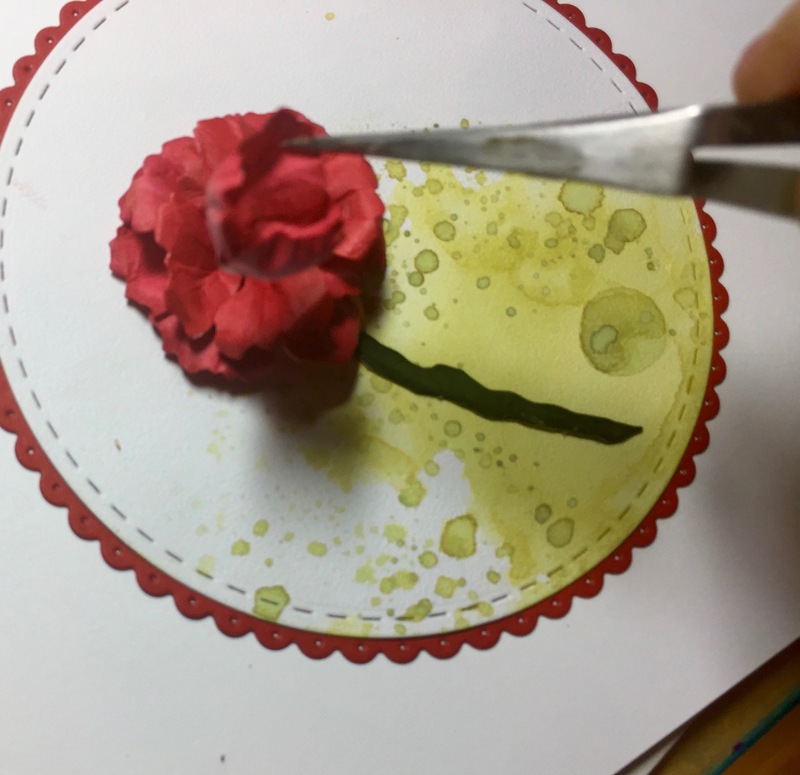 Then, glue the stem directly onto your project. 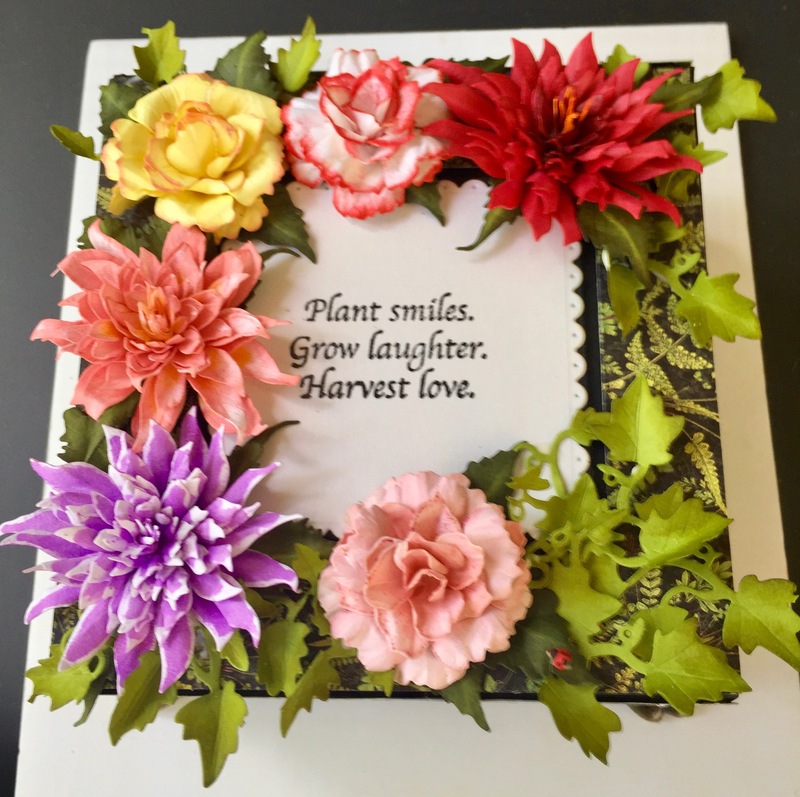 This is the beauty of Garden Notes–they are constructed right on your cards! 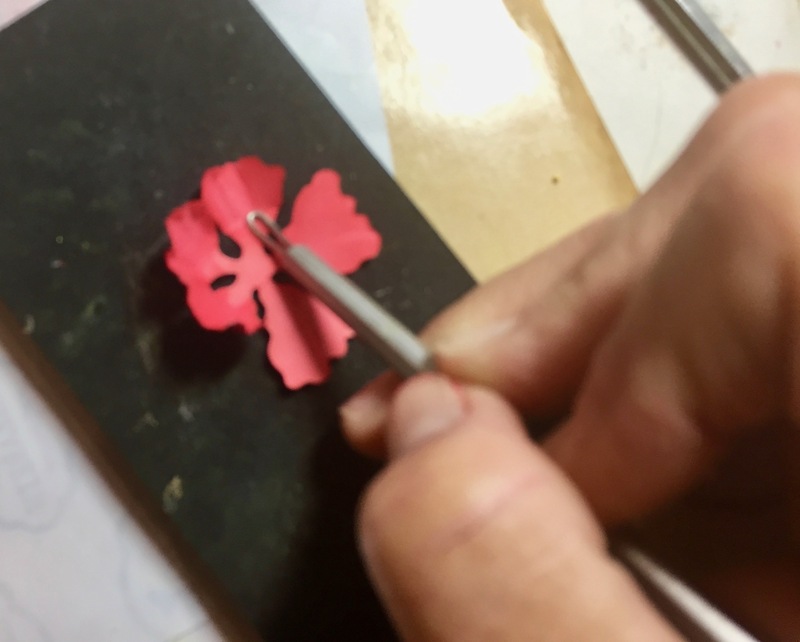 Place the one of the large 5-petal flowers on the Molding Pad, right-side down, and use the Loop Tool to Shape each petal as shown. 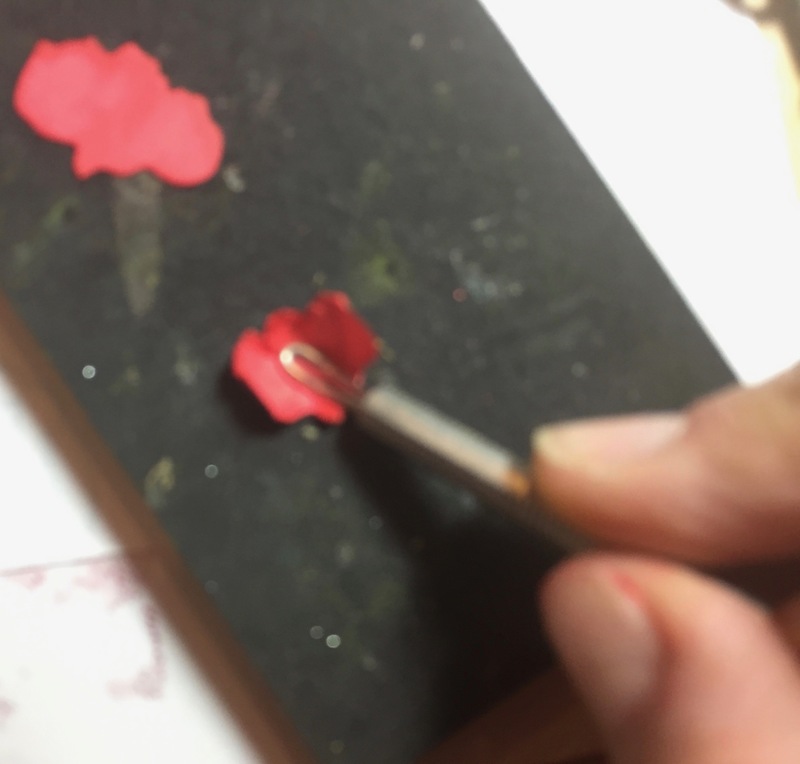 Next, use the tweezers to Pinch in the stem area, holding that pinch with your thumb and index finger, and using the tweezers to Bend down the petals. Use a toothpick to apply a small amount of glue to the underside center and adhere to the top of the stem. Repeat these techniques with the second large 5-petal flower; adhering it on top of the first flower, but slightly askew. 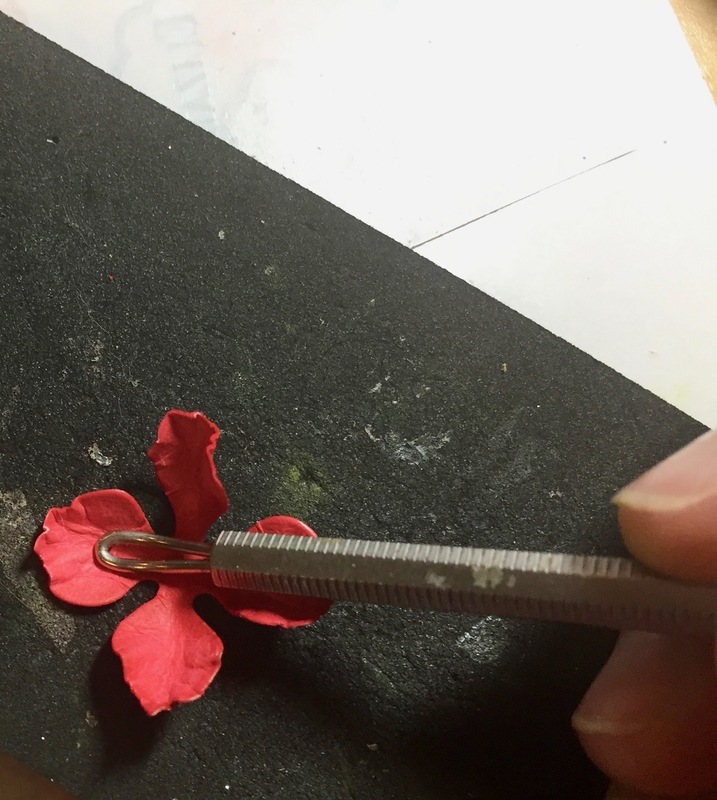 Place the “fan-shaped petal” on the Molding Pad and use the Loop Tool to shape it. Use the tweezers to Pinch the stem end. 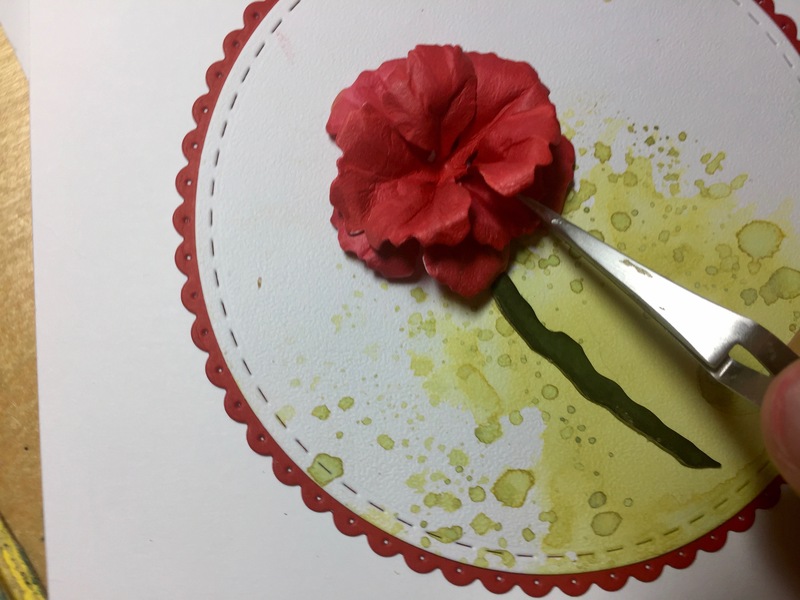 Use your thumb and index finger to hold this pinching while you use the tweezers to Bend the outer edges of this petal. Repeat with the second petal. Insert these two fan-shaped petals between the petals of the flower. 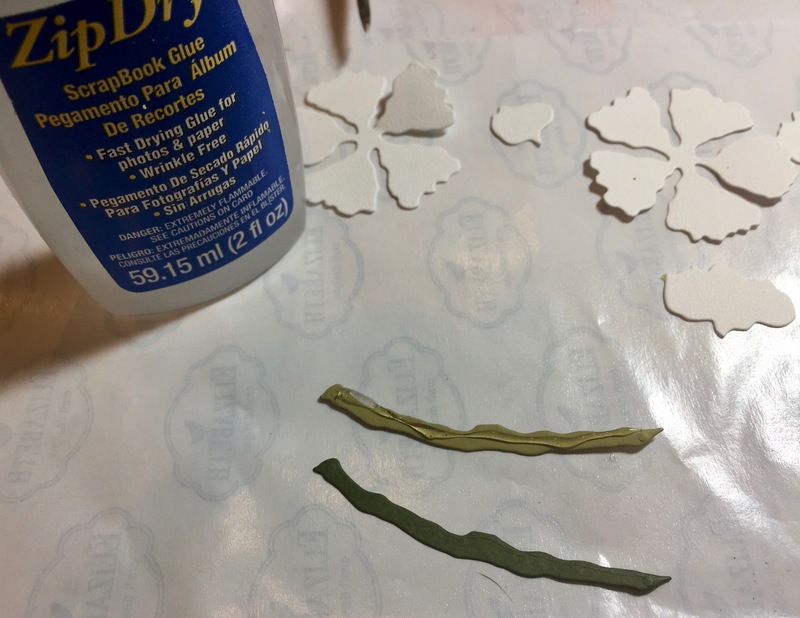 Place the 4-petal flower on the Molding Pad and use the Loop Tool to Shape it as shown. Next, use the small ball stylus to Cup the shape. 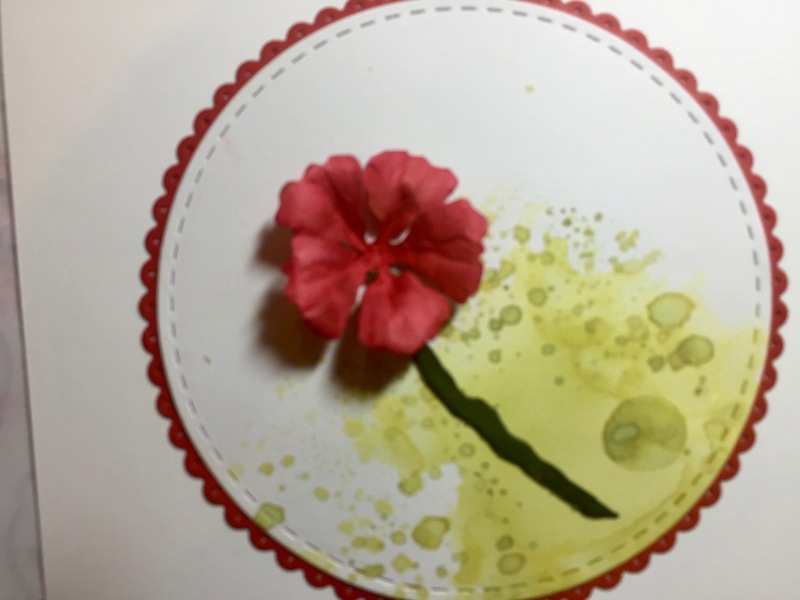 Add a small amount of glue to the bottom and adhere it to the center of the flower. Repeat with the second 4-petal flower, placing it inside the first. 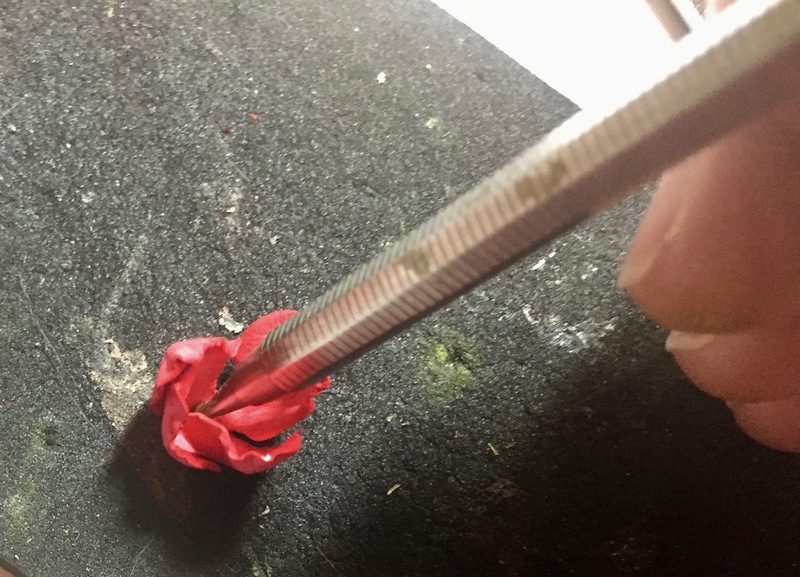 Finally, the last two petals are placed on the Molding Pad, using the Loop Tool, Shape, Pinch, and Bend. Lightly dip the stem end into the glue and adhere them around the 4-petal center. 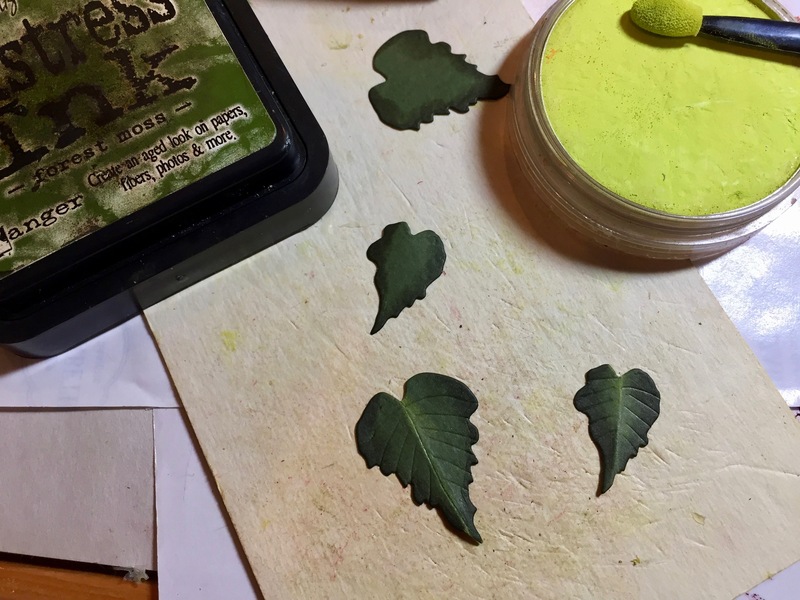 Leaves are shaded on the edges with Distress Ink, then place right-side down on the Leaf Pad and using the Leaf Tool, draw a Stem down the center. 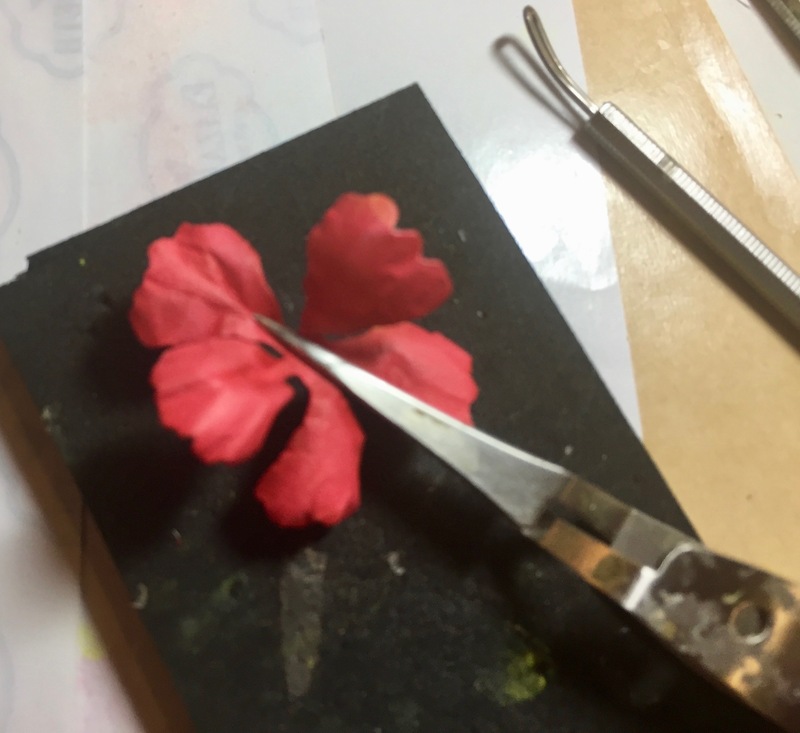 Fold the leaf in half, right-side facing you, and use PanPastels and a cosmetic sponge to shade the stem line. 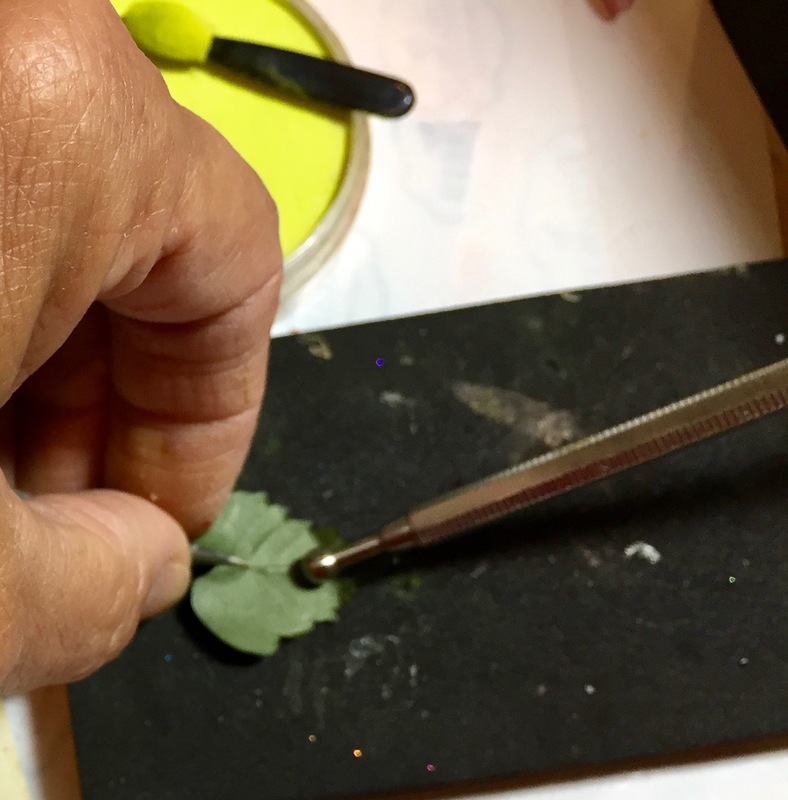 Place the Leaf back on the Leaf Pad and use the Leaf Tool to draw Vein lines on either side of the stem. 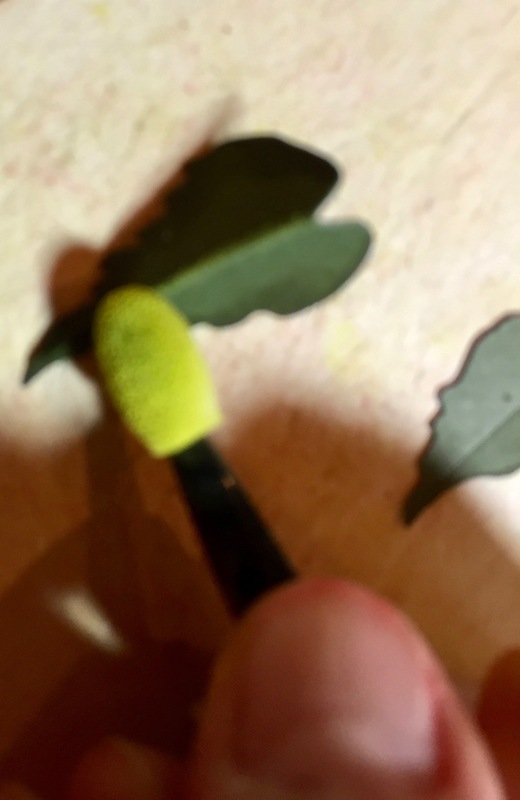 For a little more shape, pinch the stem line with your thumb and index finger, place the leaf face down on the Molding Pad, and use the Medium Ball Stylus to shape the tip by pushing down and back. 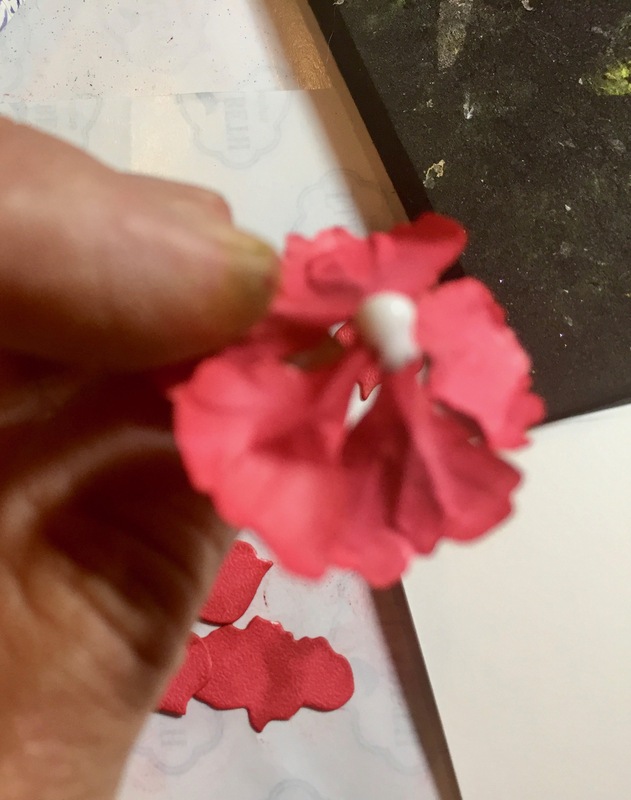 Dip the stem end into the glue and add leaves underneath the flower. 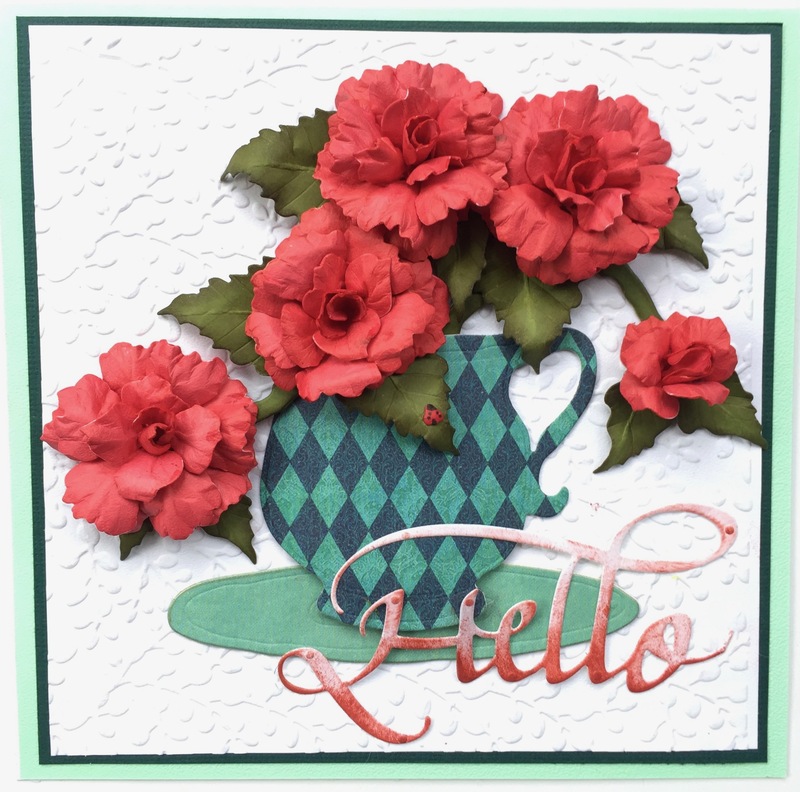 Here’s a couple more examples of using Begonias in your projects: A card with a Tea Cup-full and a Music Box between some of my Dahlias. Soft Finish Cardstock/White 85 lb. Beautiful…will give it a go soon. I really like these and they are great additions with some of the other flowers. Fabulous Susan. 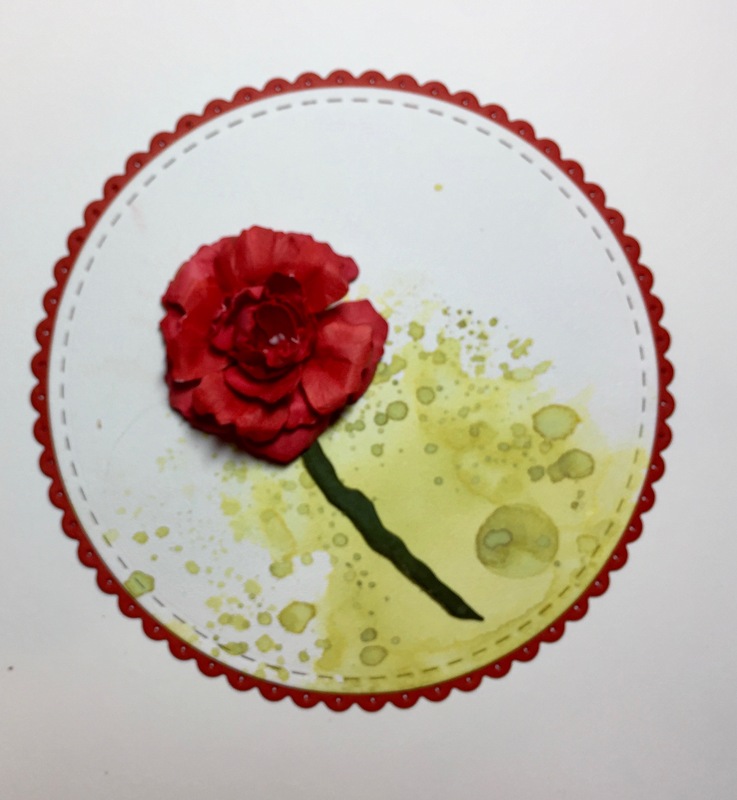 Can you tell me what colour green you are using for the stem and leaves or do you colour with copics? I’m using a medium/dark green 80-85 lb/230g and for the underneath stem, it’s called Lt. Olive and is 100 lb/270g. I like stability in my stems and to feel the dimension by using two glued together. I love these projects Susan. Really great tutorial also. Begonias are now on my wish list! 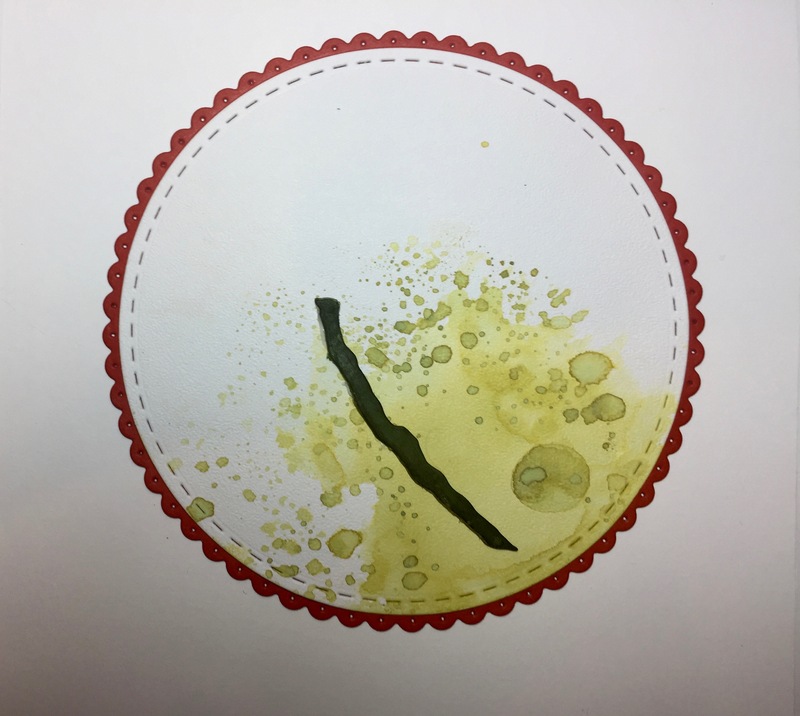 Another gorgeous creation! Thanks for the tutorial. I have not been able to view your last 2 posts. Safari blocked it on my MAC and Norton on my tablet as being a “malicious site”. Can you please check into this as I appreciate the information and inspiration you provide! Thank you.